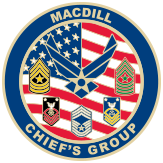 The Purpose of our organization is to improve morale and promote the general welfare of all enlisted members assigned to or visiting MacDill AFB. The Chief’s Group works diligently toward enhancing effective two-way communication between the senior leadership and the enlisted force. Because of your generosity we have been able to provide financial support along with our leadership and mentorship to these rewarding opportunities.